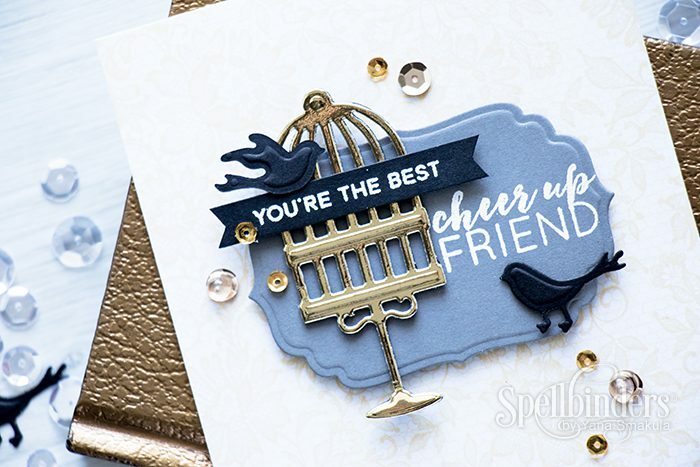 I’ve already shared a look at Spellbinders’ new die cutting and embossing machine, Prizm (see my Graduation Card Tutorial), but I have a few more projects I created using it I’d like to post here. Prizm is so small, you can literally have it in your purse and craft on the go if you need to. 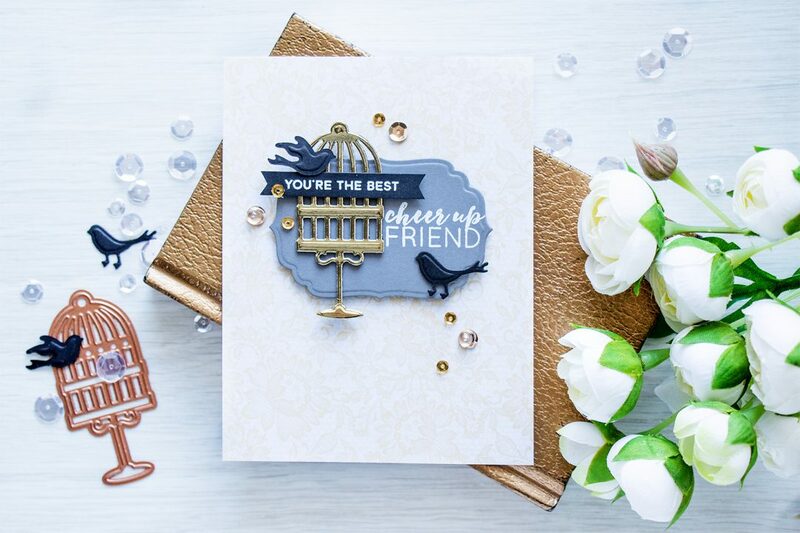 In this blog post aside from sharing another look at Prizm I’m also showing how to make the die cut face another way by embossing it from the back. I’ve also filmed additional videos with this machine, you can watch them on Spellbinders Youtube channel: Oceans of Joy | Spring Thanks. This is a simple project and doesn’t take a lot to make. I started by selecting a color combo I wanted to use and pulling out a few papers from my stash. I went with light yellow, gold, grey and black; I think its a classical combination and it always work beautifully. 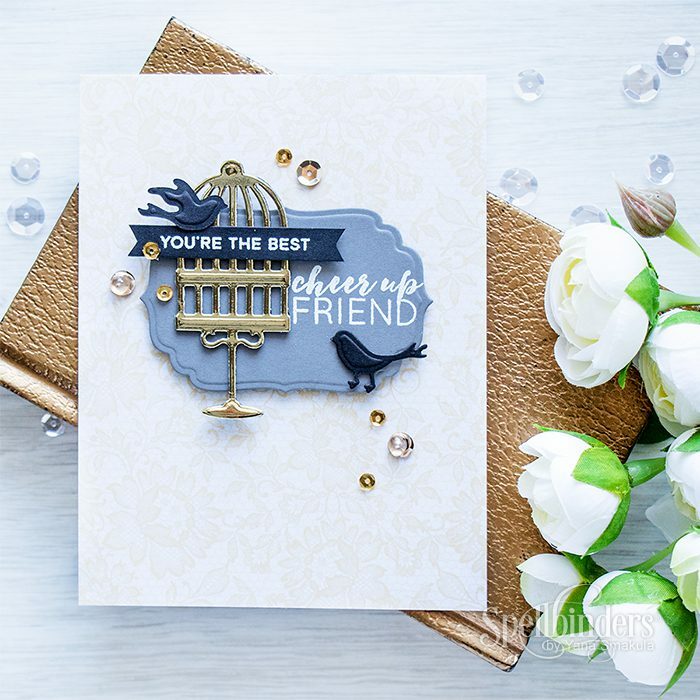 I die cut and embossed a label out of gray cardstock using a die from the Label And Accent set and heat embossed Cheer Up Friend in white embossing powder; the second sentiment, You’re The Best was heat embossed onto black; both of these come from the same stamp set from Pretty Pink Posh. I also die cut and embossed a bird card out of gold mirror cardstock. I foam mounted it onto the panel for a pop of dimension and foam mounted black sentiment strip over it. Bird die cuts were cut out of black and one of them was embossed from the back to make it face the other way. I embellished this card using a few sequins and clear drops, I have them linked below. Beautiful card. Simple and elegant. Hi Yana, very sweet, beautiful card! Great tip about turning the die around, helpful in stretching our dies!! Thanks for sharing and inspiring! A very pretty card Yana. 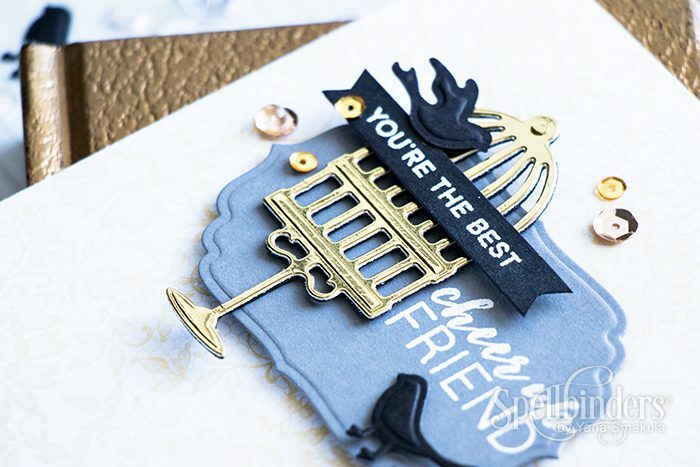 A great embossing tip about reverse embossing. Such a cute little machine! It’s beautiful and so elegant! Love gold with blue! Such a pretty card. Beautiful birdcage die. Thanks for the tip on embossing from the back.